Managers with responsibility for public pedestrian areas have never been under greater pressure to ensure that their floor surfaces meet mandatory standards for slip resistance of their floor surfaces. 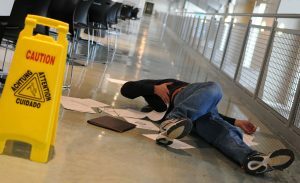 The relaxation of the rules governing the advertising of legal services, lawyers are now freer than ever to draw attention to common grounds for claiming damages, and “slip and fall” is an area they rightly see as fertile ground for their practices. We should expect to see claims for this kind of injury to continue to rise, and managers should take all necessary steps to ensure that their pedestrian surfaces meet the applicable standard and comply with current best practice. Existing surfaces must meet AS 4663. New surfaces are tested according to AS 4586. Standards Australia has published a handbook, HB 198: 2014 which helps managers understand changes which were brought about by new slip testing standards. 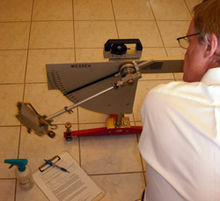 Surfaces are now tested in dry, wet and transitional condition. The new standards apply not just to continuous, impervious pedestrian services, but also to gratings, carpets and similar materials like artificial turf, as well as textiles. If your pedestrian surfaces have not been tested according to the new standards, it’s vital for the legal protection of your organisation that you have them tested forthwith. If you had your surfaces tested some years ago, do they meet the new standards? Testing entails the use of specialised equipment, and should be performed by a NATA-approved organisation such as SGS Testing Australia. Wespray On Paving passes the new standard with flying colours, and is a cost-effective way of bringing old, non-compliant concrete surfaces into line, not just with the applicable standard but with best practice. To discuss resurfacing your pedestrian areas, give Wespray On Paving a call today. The City of Swan ‘City Gateways Project’ cont.